Cannot be Normal Summoned/Set. Must first be Special Summoned (from your hand) by banishing 1 LIGHT and 1 DARK monster from your Graveyard. Once per turn, you can activate 1 of these effects. ● Target 1 monster on the field; banish that target face-up. This card cannot attack the turn this effect is activated. ● If this attacking card destroys an opponent’s monster by battle, after damage calculation: It can make a second attack in a row. 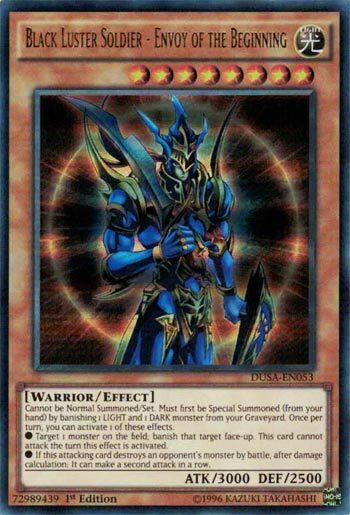 Never thought I’d see the day where Black Luster Soldier – Envoy of the Beginning would be at 3…AND IT WOULDN’T MATTER! This card is still a boss monster that should be feared, and I fully expect it to at least go to 2 at some point. Drop it by removing a LIGHT and a DARK, too easy, 3000ATK/2500DEF, awesome stats, support from type and attribute behind it, and then you get to its effects. Monster removal no matter the position of the monster or a double attack, many times that second attack being direct. This card is still a strong card and can be splashed into any deck that runs a few LIGHT and DARK monsters. And to top it off, it can still be brought back from the grave with CoTH or Soul Charge if you brought it out correctly the first time. If I ran a few LIGHT monsters in my DM deck, I’d run at least a copy of him. Black Luster Soldier – Envoy of the Beginning has been reviewed repeatedly, always with a high score. Now it is available at 3, and it still is going to get a high score. Easy summon conditions are great. Targeted removal of a monster isn’t perfect anymore, but it’s better than nothing. The ability to attack twice is beautiful offense. None of these aspects of BLS are once per turn. If you have 3 BLS Envoy on the field you can banish 3 monsters or attack 6 times if the conditions permit. Most importantly, all of these aspects are still relevant today. Therefore there is enough evidence to support the notion that BLS Envoy will continue to be relevant in the game. I am absolutely stunned we got to the point where it is safe for Black Luster Soldier – Envoy of the Beginning to come back to three. Shows you how far this game as come. Remember when this was absurdly broken and banned for many years? BLS – ETOB is a Level 8 Light Warrior with 3000 ATK and 2500 DEF. Stats are great, type and attribute are good, and Level is fine for a boss monster. BLS cannot be Normal Summoned or Set and must first be Special Summoned from the hand by banishing any Light and Dark from the GY. Very easy to meet this condition if you play Lights and Darks, which several decks can do. If you do summon this properly and it dies, Monster Reborn can revive it. In return, you get either of these effects once per turn. Target a monster on the field and banish it face-up, but this card cannot attack. If this card destroys a monster by battle, it can make a second attack in a row. Two really good effects. The first effect is just Chaos Sorcerer, but on a stronger body and I believe Chaos Sorcerer cannot banish face-down monsters. Sure this card cannot attack like Chaos Sorcerer, but I assume that was to attempt to balance this card, which they did a poor job of back in 2004. The second effect should be easy to pull off since this has 3000 ATK. Really good monster for clearing out monsters, just know when the first effect is good to use if the second effect isn’t safe. Very good boss monster, even in 2018, despite it being safe for being unlimited. Throwback Thursday I decided to look at Black Luster Soldier–Envoy of the Beginning. Why? Well, the new Ban List has this card at 3…did anyone ever see a day coming where that was going to happen? BLS is still one hell of a card, let me start with that. It’s unlimited not because it’s bad, there’s just many a Monster and card alike that can answer the Envoy these days. I do, however, feel like we’re being dared to make a Deck that runs 3. Just imagine someone running a SJC with 3 BLS in their Deck…this guy might not find himself unlimited for that long if such a thing were to happen. But I’m just spitting out possibilities here. When this card came out all the way back in Invasion of Chaos, we had this, CED, and to a slightly lesser extent, DMoC…we weren’t really in an era of Boss Monsters yet. We had less in the card pool (obviously) and we didn’t even have a Ban List yet. It’s still easy as ever to summon, it can remove Monsters, it can potentially double attack, and has 3000 attack to boot. Let’s see what, if anything, happens or changes, with this card at 3.